I learned that the willingness to do silly things can help build a sense of teamwork and create the feeling that we’re all in this together. I’m a pretty reserved guy. I dress in typical ways, with no desire to stand out. I do my job, then drive home to my wife and kid. I’m the last person you’d expect to suddenly show up one day with shocking, neon blue hair. But I had no choice. I’d made a promise. I oversee a team of sales representatives at Outreach, a tech company based in Seattle. Thanks to new technologies, we’ve found that we can hire people straight out of college or from other fields, and get them trained quickly. In June, I had a team of five brand new recruits who had never been in tech sales. We also had an ambitious goal: to beat all previous first-month sales records. This required some kind of special incentive. But I had no idea how to wrangle budgets to get prizes like trips or tickets. I needed to come up with something free, but still powerful enough to motivate them. An idea popped into my mind, so I just went with it. 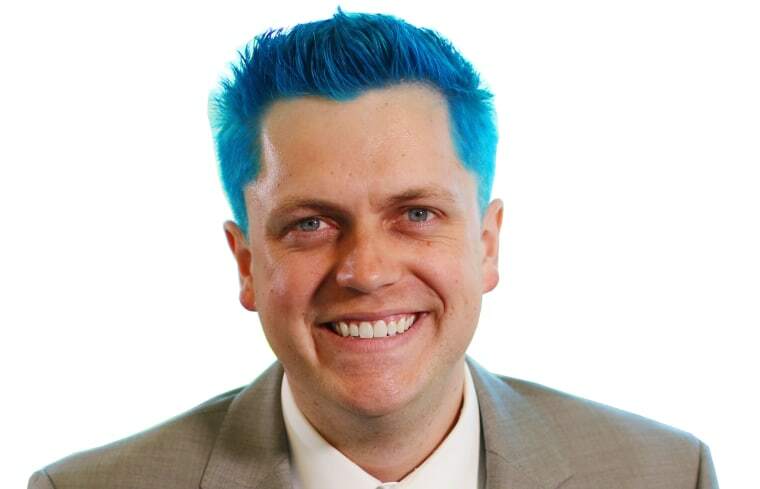 I told them that if we beat the record, I’d dye my hair blue — and not just for a day. Permanent dye to last until it grew out. My team laughed, and asked whether I was serious. When I said yes, their eyes lit up. They ended up blasting the previous record out of the water. And while there are many reasons — they worked hard and we built a great process — they made clear that getting me to look like an anime character or Stanley Tucci from The Hunger Games was part of what drove them. There are a few reasons this idea worked. First, injecting some humor and playfulness into the atmosphere of a high-stress job can be very helpful. Sales in particular can be very tough, since it means facing constant rejection. It’s one of the careers with high rates of depression. When things got tough for our team during that first month, someone would crack a joke about my future look. We’d laugh, and the team would push forward. There’s also something more to it. I wasn’t just offering something fun, I was offering to humiliate myself in a way that would last months. The desire to see people willing to make fools of themselves for a good cause is also the thinking behind the viral ice bucket challenge that helped raise money for ALS research. That speaks to a philosophy I’ve developed about work in general. I’ve found that many people are willing to work hard, but few are willing to risk personal embarrassment to achieve a goal. When someone is willing, other people admire that as a form of courage. And they want to see it play out. This helps explain why a United Way chapter and SignUpGenius have recommended fundraiser incentives like “Get the Boss” or “Embarrass the Boss.” Options include dunking them in a tank of water, getting them to shave their head or doing an old fashioned pie-in-the-face. The desire to see people willing to make fools of themselves for a good cause is also the thinking behind the viral ice bucket challenge that helped raise money for ALS research. When our sales results came in, our team celebrated. No one brought up my hair, and some of them weren’t sure whether I would do it. But that weekend, I found a stylist who spent hours putting together a concoction. He bleached my brown hair bright white to get rid of any color, then used a unique mixture to make it the most obnoxious, bright blue he could muster. It took hours and cost $250. Heading to work that Monday, I was self-conscious and very nervous. But I decided to own it. Everyone who saw me laughed — but also loved it. I also posted about it on LinkedIn. Soon, my new photo and post explaining the hair got thousands of views. It’s a kind of attention I wasn’t used to getting, but have found it to be a good opportunity to share ideas. In fact, I’ve decided to keep my hair crazy blue for the time being. I wear it as a badge of honor. As a sign to my employees that I will pull through for them, no matter what, if they give it their all. And as a message to everyone: It isn’t easy to make a fool of yourself. But if you can cross that line, one very few people are willing to cross, there is a lot of opportunity on the other side. Sam Nelson is an outbound SDR manager for Outreach, a sales engagement platform.